Description When you search on a word using Google search, ads show up to the right of the search results. For example, if I search on the word "bicycle", an ad for Lee's Cyclery in Fort Collins shows up. If I click on the ad, then I go to the Web page for Lee's Cyclery. Each time someone clicks on the Lee's Cyclery ad, Lee pays Google a fee. This system is called Google Adwords. A business makes ads and chooses keywords. The goal is to sell more product. Some keywords work better than others. Periodically a company has to decide which keywords should be paused or deleted. 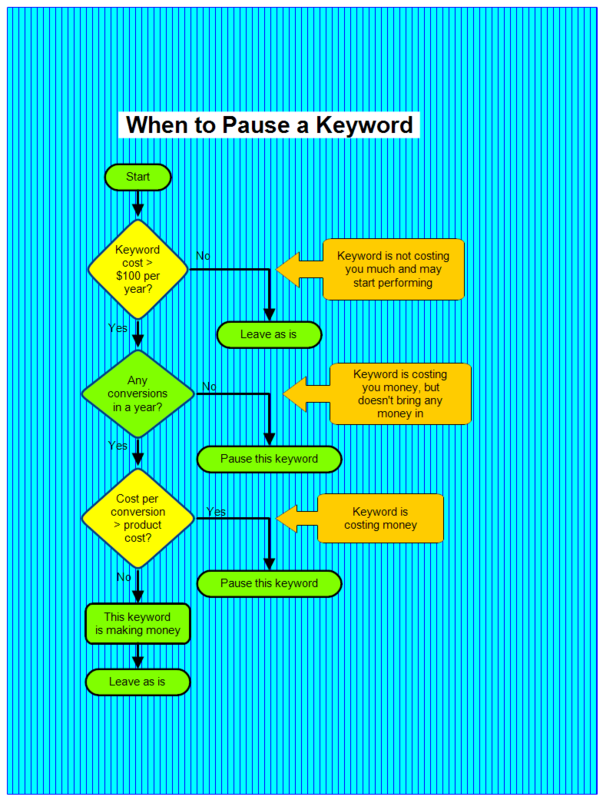 The above chart steps you through whether a keyword should be paused. A conversion is when a customer clicks on your ad and then within one month purchases your product. Some customers will see your ad and not click on it. That doesn't cost you anything. Some customers will click on your ad and not purchase your product. For each click, Google gets paid. The cost per click depends on the keyword and its placement in the list. If you get a lot of people to click on your ads, but they don't purchase anything, your conversion rate is 0. Suppose you are paying Google $.50 per click. A thousand people click on your ad, so you pay Google $500. Of these thousand, 20 people purchase your product. Your cost per conversion is $500/20 or $25. You have paid $25 to get a customer to purchase your product. Whether that is good or bad depends on how much money you make on each sale. Suppose your product costs $49 and your cost per conversion for a keyword is $60. Then you are losing $11 on each sale. Keywords that get a lot of clicks but not many sales lose money and should be paused. For each keyword, follow the flowchart above and determine whether it is a good keyword and should be retained. You can download this chart and modify the decisions. You might want to change the first decision to look at keywords that have had 1000 impressions or 200 clicks, rather than a monetary value. If the keyword doesn't have many impressions, you can't really tell whether it is good or bad. Once RFFlow is installed, you can open the above chart in RFFlow by clicking on pause-keyword.flo. From there you can zoom in, edit, and print this chart. It is often easier to modify an existing chart than to draw it from scratch.